Water damage is bad. Sewage damage is worse. 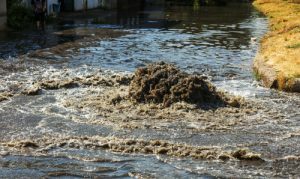 Sewage may enter your house as part of generalized widespread flooding as water on the move becomes contaminated by the contents of swamped municipal sewer systems, overflowing septic tanks and other sources. Or, it may result from a blockage in your household sewer line triggering a backup into the house. When soaked by sewage for an extended time, absorbent materials incorporated in home construction including wood, gypsum board, insulation and even concrete may become permeated and pose a continuing source of contamination. Standard water damage remediation techniques are not sufficient to neutralize the health threat. In addition to risks due to contact with sewage, airborne hazards proliferate, too. Within a short time frame, aerosol contamination accumulating within the enclosed confines of a sewage-inundated house can reach levels that pose potential disease threat due to inhalation. The same conditions present during sewage inundation by flooding or backflow—wetness, high indoor humidity and the presence of organic matter—also trigger the proliferation of non-sewage microorganisms, most frequently toxic mold growth. These consequences typically begin within 48 hours. Decontamination after raw sewage has affected a home isn’t for the do-it-yourselfer. As soon as possible, proven effective remediation techniques must be applied. Professional remediation includes complete removal of all contaminated water using deep-cleaning wet extraction machines, removal and sanitary disposal of sewage-soaked carpet and other materials, and continuous dehumidification of the interior of the house. In some cases, highly absorbent building materials that have been thoroughly soaked with sewage may need to be removed and replaced. A range of disinfectants may be applied to affected surfaces, formulated for the specific purpose and the type and absorbency of the material. Technicians at work on the project will wear respirators, rubber gloves, boots, splash goggles and a protective suit to prevent illness from contamination. This entry was posted on Tuesday, September 4th, 2018 at 9:13 pm and is filed under Water Damage & Cleanup. You can follow any responses to this entry through the RSS 2.0 feed. You can leave a response, or trackback from your own site.